Manor Independent School District is a rapidly growing, diverse district near Austin, Texas. It serves over 8,700 students at two high schools, two middle schools, eight elementary schools, and one alternative academy. Located 12 miles northeast of Austin, a hub of the high-tech industry, the district is focused on providing 21st century skills to help students thrive in today’s world. Since the early 2000’s, Manor has realized that classroom technology is an important tool for instruction. Middle and high school classrooms had computers and document cameras with mounted projectors. Most elementary classrooms had a projector on a cart, but some teachers could only access a projector by checking one out from the library. While this arrangement did indeed provide access to 21st century technology for instruction, improvements were needed in the areas of control, connectivity, and ergonomics. In the upper grade classrooms, projectors were controlled with handheld wireless remotes, which made the technology difficult to use if the remote were misplaced or needed batteries The systems were also designed for a single input, so teachers would have to plug and unplug sources as needed. Cart based projection systems required power and source cables to run across the floor, posing a potential trip hazard for students as well as teachers. Fan noise and heat from the projector could also be distracting. We are committed as a district to implementing technology that engages students and is user-friendly for educators, and Extron systems fit in perfectly with those goals. In May of 2014, voters within the Manor school district approved a $124.9 million bond to address growth, instructional program needs, safety and security, and facility repairs and improvements throughout the district. This included many school, campus and facility upgrades as well as technology for classrooms and students. Included in the classroom technology improvements were Extron PlenumVault Digital Systems for all elementary, middle, and high school classrooms. Classrooms in the elementary schools were also equipped with Extron VoiceLift Microphone Systems for amplifying the teacher’s voice. Key components of the technology improvements were access and control of AV systems. The PlenumVault Digital system provides numerous HDMI and VGA inputs so that teachers and students no longer need to unplug cables to switch between sources. In addition, the wall mounted MediaLink controller solves all the problems related to IR remotes, and makes powering on the system, switching sources and adjusting volume much more intuitive. Manor had several choices when it came to display devices. They needed to decide whether it would be best to install projectors or flat panel displays, and how they would be mounted. Extron PlenumVault Systems support both display types in any mounting configuration. Ultimately, discussions with teachers and instructional technologists led administrators to choose ceiling mounted projectors for every classroom. Projectors provide the larger images needed for classroom instruction, and pull down screens allowed teachers to maximize instructional whiteboard space when the system is not in use. Part of Manor’s goal in creating 21st Century Classrooms involved making sure students have the right tools to support the learning environment. To this end, the district embarked on a program to make sure every student has access to an iPad for classroom activities. High school students have their own device for homework, while Elementary and Middle have complete sets for in-class work. Manor knew that elementary age students are still developing their listening abilities, and deployed Extron VoiceLift Microphone systems to assist. With VoiceLift, the teachers voice is slightly amplified above ambient background noise so they can be clearly heard by students throughout the room. “The VoiceLift Microphone is great at increasing student engagement, especially at the elementary level, where its crucial teachers are able to connect with all students,,” says Avery. In addition to increased student engagement, teachers report that they have more energy at the end of the day because they do not experience the fatigue and vocal health issues associated with having to use their “teacher voice”. The next step for Manor is to deploy Extron GlobalViewer Enterprise software. This will allow the district to manage and support all of their classroom AV systems over the IP network. The software helps save on energy and routine maintenance expenses by automatically shutting down projectors and systems at the end of each day. In addition, it allows for remote troubleshooting to diagnose and resolve system issues quickly. 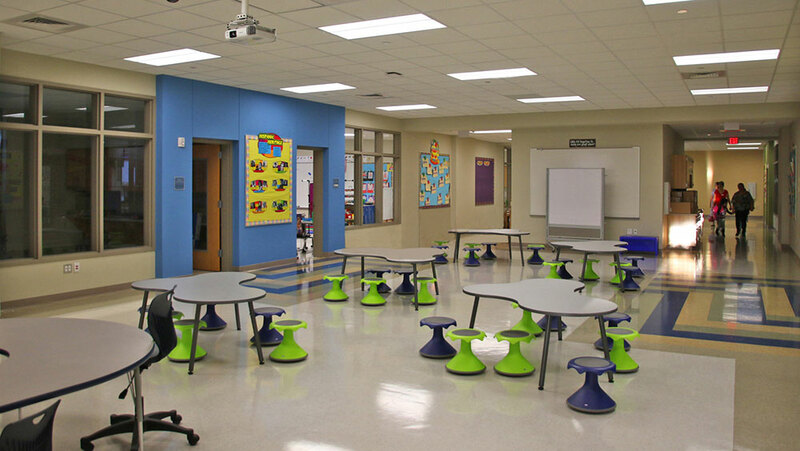 Flexible furniture and technology support a dynamic learning environment at ShadowGlen Elementary.